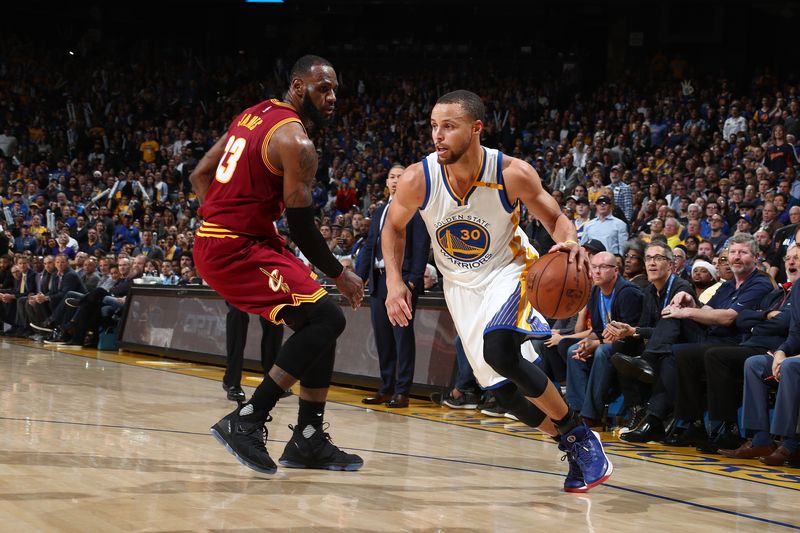 The Golden State Warriors played excerpts from several Martin Luther King Jr. speeches during the holiday game in which they routed LeBron James and the reigning NBA champion Cleveland Cavaliers on Monday night. Longtime Warriors legend Al Attles — who actually heard King speak live in 1958 — watched from his perch atop the lower level of Oracle Arena. In 1958, King was prohibited by the local government from speaking publicly in Greensboro, North Carolina, which included Attles’ school, the historically black North Carolina A&T State University. But Bennett College president Willa Beatrice Player allowed King to speak at the private, predominantly black women’s school on Feb. 11, 1958, in Greensboro. Attles was a sophomore basketball star at N.C. A&T at the time. He joined many of his classmates by taking the short trek to Bennett College to listen to King speak in a packed Annie Pfeiffer Chapel. King’s speech was called “A Realistic Look At Race Relations.” The Nobel Peace Prize winner’s speech was highlighted by his view of the importance of voting intelligently while noting the limitations between Republicans and Democrats. Although the speech took place nearly 59 years ago, Attles, who has been affiliated with the Warriors since 1960, still remembers it vividly. 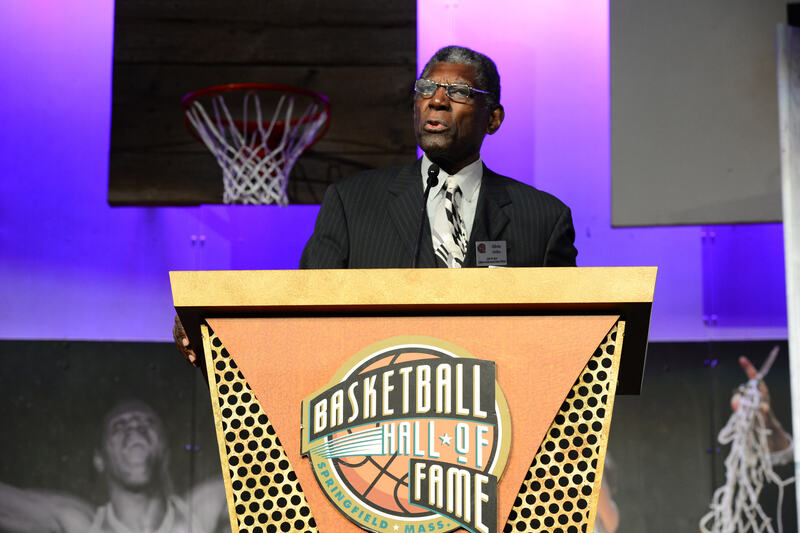 Al Attles, winner of the John W. Bunn Lifetime Achievement Award addresses the guests at the Family Reunion & Awards Dinner as part of the 2014 Basketball Hall of Fame Enshrinement Ceremony on August 7, 2014 at the Naismith Memorial Basketball Hall of Fame in Springfield, Massachusetts. “King spoke about the importance of what he was doing,” said Attles, who coached the Warriors to an NBA title in 1975 and played with Wilt Chamberlain when Chamberlain scored 100 points. “It was very interesting that he had to speak at a private college. He talked about the importance of getting an education. He talked about people making a statement on trying to improve the situation for African-Americans, who they called Negroes or blacks back then. “It’s a special day. I’m proud to be part of it,” Lue said. Kerr wore an MLK Day T-shirt before the game and said he had read some of King’s quotes earlier in the day. “It’s a reminder that we are products of our own environment,” Kerr said. “Some of us are much more fortunate that others. I know, from my own life, there is no way I would be sitting here without the family support I had and the upbringing that I had. So many people are left behind. Stephen Curry #30 of the Golden State Warriors drives to the basket against the Cleveland Cavaliers on January 16, 2017 at ORACLE Arena in Oakland, California. Warriors veteran forward David West called it an honor to play on MLK Day, but said he believes the holiday weekend has become commercialized. “If you look at Dr. King as a total picture as opposed to a small snapshot in a couple days that folks like to glorify, he was a powerful, powerful energy for us,” West said. “He gave us life, sacrifice to his family and his personal energy for a great cause. I think when you look at him in a clear picture, he was as powerful as any person that has been on this planet because, obviously, he lost his life fighting for what was right. Don't forget to keep at least one eye on the prize today! There is perhaps no NBA player who is more of a black history aficionado than West, who believes that African-Americans should research and know their history. The two-time NBA All-Star said his “most valuable possessions” are some “very old” black protest books of the South, dating to the late 1800s, that were passed down to him from his late grandfather, Amos West Sr. The 14-year NBA veteran also owns outlines of his grandfather’s church sermons from when he preached at Baptist churches in North Carolina during segregation. Moreover, West said his father, Amos West Jr., was part of a nonviolent protest sit-in at a lunch counter at Woolworth’s in Greensboro, which refused to serve blacks before desegregating in 1960. West himself has held a silent protest for years during the national anthem before games that he previously said was “a lot deeper” than the police brutality against African-Americans that San Francisco 49ers quarterback Colin Kaepernick protested. Whether it was about King or other important icons, West’s father and grandfather taught him black history since he was a very young child.